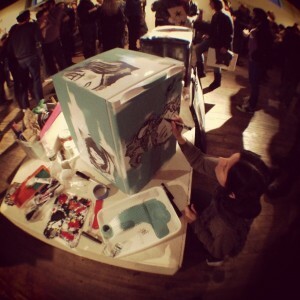 Mini Fridge Painting at Artist-‘N-Ales! Fun times at the Artist-‘N-Ales Winter Brew Event! Happy that this mini fridge found a home. Thanks to 4 Hands Brewery, Peat Woellager (Eyez), all the Chicago Breweries, artists and patrons who participated. This entry was posted in Art Shows, Things That I Make..., Uncategorized. Bookmark the permalink. Post a comment or leave a trackback: Trackback URL.